Please note: If signing up on a mobile phone, you will be directed to download the FREE MindBody app. To skip this step, register on a computer. *Please provide a water bottle for your child, FREE breakfast available before training. 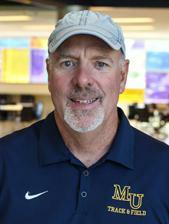 Coach Mike Holman, who has more than 30 years of coaching experience in cross country and track and field, is in his sixth season at the helm of the Marian University cross country and track and field programs. During his 23-year stint as head coach at Lawrence Central High School, Holman coached two state championship teams, four state runners-up teams, 20 conference championship teams and three conference titles in cross country. Coach Kiel has over 10 years’ experience in Sports Performance, Strength and Conditioning and CrossFit. He was a 3 sport athlete at Lawrence Central High School and went on to play baseball at Ball State University where he earned a Bachelor’s Degree in Exercise Science.